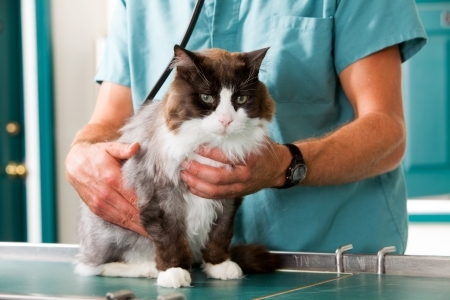 Does your cat hide in the back of her carrier and try to scurry away during vet examinations? It’s not uncommon for cats to get scared during vet visits, but there are a number of strategies you can use to make these trips a little less stressful for your favorite feline. Finding the right carrier can go a long way toward making vet visits a whole lot easier. First off, you’ve got to have the right size—a carrier should never be more than twice the size of your cat, as larger carriers can actually make small cats more nervous. The materials also depend on the size of your cat—a bigger cat may demand a hard carrier, while a smaller cat can be held in a soft bag if they’re comfortable. Making sure your cat actually likes her carrier is the most important thing, so keep it around at home so she can get used to stepping in and out of it. Your cat might get scared of car rides if she only associates them with trips to the vet. To get her used to the idea of riding in the car, take her for a leisurely weekend drive that ends with a few of her favorite treats. This way, when it’s time to drive to the vet, she won’t be so nervous about getting in the car. We know what you’re thinking—a cat on a leash? But actually, keeping your cat on a leash with a comfortable harness can help them feel like they’re more in control of their surroundings (which is the reason why they get so scared in the first place). Cats are much less likely to jump away at the sight of a vet if they’re in a harness, and who knows—they might even wind up enjoying it!